Silver Surfer slot machine from Cryptologic gaming software is a fun game for the most part. Graphics and sound are something out of a child’s arcade in the 60s, but the theme will keep comic book fans engaged and entertained. 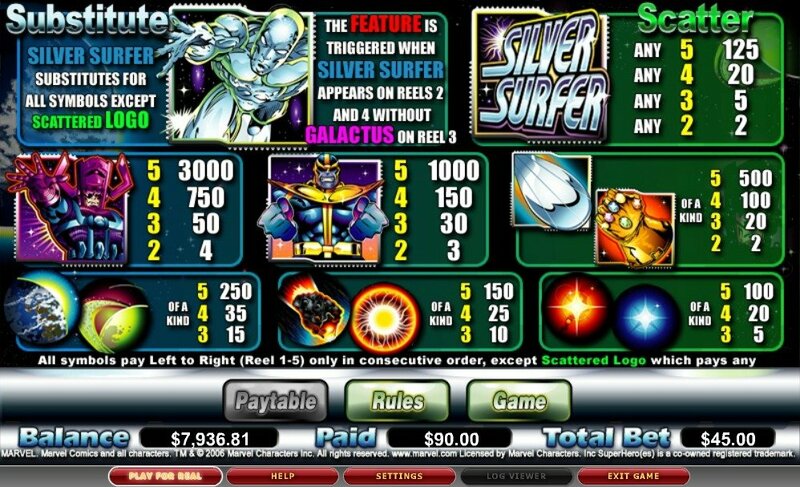 Cryptologic’s Silver Surfer slot machine is another production that fits into their line of comic book themed games. 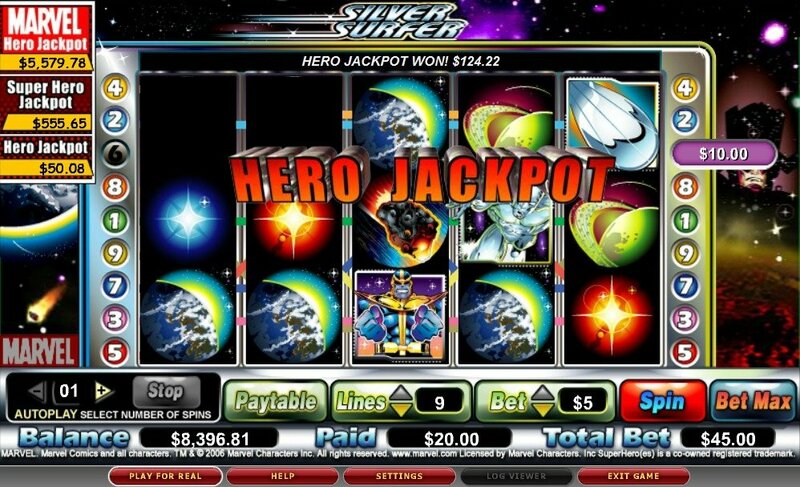 From Batman and Superman to the Green Lantern and Flash, these marvel slot machines including Silver Surfer are all connected to one progressive jackpot that can be won on three different levels making the winnings big and often. While Cryptologic’s line of marvel slot machines provides players with exiting, action packed themes where your favorite super heroes dash across the cosmos defeating the bad guys, they aren’t known for having the best visual or audio experience. With poor quality audio effects, not background music, and rough graphics, Silver Surfer slot machine is no exception. Symbols of Galactus himself will produce the biggest wins besides the Silver Surfer scatter symbol, 5 of which could win you 125X your total spin bet. This may however, but a conscious choice made by the creators. I won’t pretend to big a big comic book fan, so I’m not so familiar with this type of art that so many people love. It could be that what I see as visual and audio flaws are in fact beautiful adaptations for the avid comic book fan. In this game the Silver Surfer is battling against Galactus, the cosmic being he was once forced to work for. Symbols of Galactus himself will produce the biggest wins besides the Silver Surfer scatter symbol, 5 of which could win you 125X your total spin bet. Other common symbols include the Silver Surfer’s silver board, planet Earth which the Silver Surfer is fighting to save, an asteroid hurtling through space, and a bright blue star. The Silver Surfer represents this game’s wild symbol and also triggers the special feature. When he appears on reels 2 and 4 and Galactus isn’t on reel three, the Silver Surfer expands to make these two reels wild and two re-spins are awarded for some big wins. 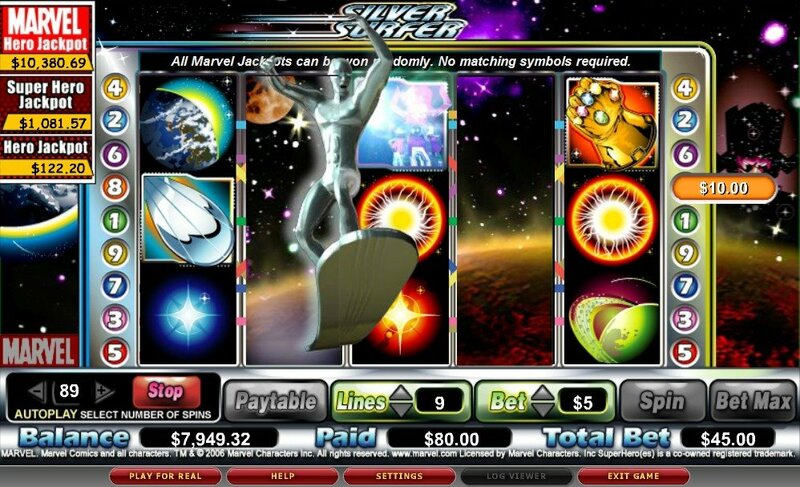 Besides these ways of winning, Silver Surfer slot jackpots are connected to Cryptologic’s Marvel Jackpots. Here you can be the lucky winner of the Hero Jackpot, the Super Hero Jackpot, and the Marvel Hero Jackpot. These jackpots are all progressive and each is bigger than the one before it. The jackpots are won on random and make the Silver Surfer slot machine worth investing in.